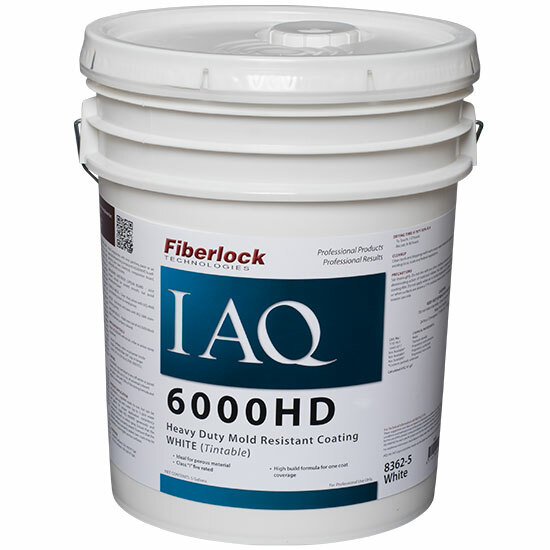 Ideal for use during new building construction, IAQ 6000HD is designed with durability and flexibility to resist mold growth on the dry coating surface. Use it on non-porous and semi-porous building materials, including gypsum wallboard, oriented-strand board (OSB), wood framing timbers, plywood, masonry block and many other structural surfaces where a flexible, high-build, mold resistant coating is necessary. Carefully clean up with a wet mop or HEPA vacuum. Surfaces to be coated must be free of dust, mildew, mold, dirt, grease, loose paint, oil, glue size, calcimine, wax, soap and other surface contamination. Clean mold stained surfaces with Advanced Peroxide Cleaner, or use an EPA registered antimicrobial disinfectant cleaner such as IAQ 2000, IAQ 2500, ShockWave or ShockWave RTU. Patch irregularities with vinyl patching paste or an appropriate patching compound. IAQ 6000HD is self-priming over bare sheetrock, composition board, ceiling tile and concrete. Joint cement should be sanded smooth, but avoid abrading the paper. Clean, then prime with IAQ 4000 rust inhibiting direct-to-metal primer. Seal knots and stains with IAQ 5000 stain-blocking primer. Apply one coat of IAQ 3000 block filler if a denser surface is desired. Apply IAQ 6000HD with brush, roller or airless spray equipment. Spray: .021 to .025 tip @ 2000-2800 P.S.I. IAQ 6000HD may be tinted to any off-white or pastel based color. Add up to 2 oz. of universal colorant per gallon. Start with 50% of the tinting formula and adjust as necessary. IAQ 6000HD is supplied ready to use, but can be thinned sparingly with water (up to ½ pint water per gallon) for proper application consistency if necessary. Apply IAQ 6000HD generously and uniformly by brush or airless spray. Ensure that the finished surface is properly sealed. To ensure that the finished surface is properly sealed, two-coats may be required on some highly porous surfaces. Clean tools and drippings with warm soapy water before IAQ 6000HD dries. Dispose of waste according to all existing local, state and federal regulations. Store in a dry place at temperatures between 40°F (4.5°C) and 90°F (32°C). Stir thoroughly. Do not mix with any other coatings, solvents or colors in oil. IAQ 6000HD is resistant to the deteriorating action of mold and mildew. No claim is made for the preservative action other than to the coating film. The use of this product does not protect users or others against food-borne or disease-causing bacteria, viruses, germs or other disease-causing organisms. Do not apply when air or surface temperature is below 50°F, when drying conditions are poor or when surfaces are above an 11% moisture level content. Use adequate ventilation during application. For interior use only.